Jay Ryan stepped into the ring during 2005 and has already proved himself to be a knockout hit with audiences, promoters and fellow comedians alike. Never pulling a punch, Jay's rock solid brand of observational, self-depreciating and no nonsence comedy will hit you square between the eyes, leaving you swooning and ready for another beating as soon as possilbe. A unique addition to the circuit, Jay is a comic who can float like a bee and sting like a butterfly. "A very likeable new act with an easygoing manner and really good material, he has what it takes do very well indeed." - Toby Hadoke X/S Malarkey. "Jay's instantly likeable and has the tools to go all the way, a star in the making, watch this space!" Mike, Limelight Comedy Crewe. "A vey funny and laid back breath of fresh air to the comedy circuit, really going places." - Dave Twentyman. "If you get a chance to see Jay take it now! Great material delivered in a easygoing manner that is just fantastic. He never fails to impress. He has such a great way about him on stage, a joy to watch. Going all the way to the top for sure!" Paula Harrington, Tongue in cheek comedy. I saw Jay perform his second ever gig, which was brilliant! And he continues to get better all the time. A big man with a big talent, who is sure to go far. John Bishop. 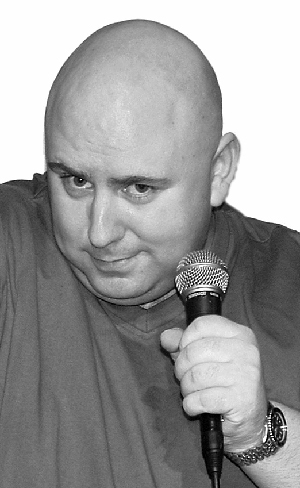 Jay has performed at the Rawhide Comedy Club, Liverpool. The Comedy Strore, Manchester. X/S Malarkey, Manchester. Global comedy, Wigan. The Zanzibar, Liverpool. The Smirking Smile, Manchester. Lock'N'Load, Blackburn. Frog & Bucket, Manchester. And may other venue's. Rawhide workplace challenge winner 2005. Phones 4U Competition at the Comedy Store Finalist 2005. Frog & Bucket, Beat the frog winner 2006. Tongue in cheek new act competition, Finalist 2006.